When we are young, our metabolism is very flexible and responds quickly to changes in blood glucose. Our tissues are very sensitive to insulin and respond quickly – called insulin sensitivity. When blood glucose levels start to rise, the pancreas releases insulin, which helps to transport the sugar into muscle and tissues, where it is used as energy or stored. Insulin also tells the liver to stop making glucose and the muscles to store fat (as there is sufficient energy circulating in the blood as glucose). As long as insulin levels are within a normal range, your metabolism is programmed to use carbohydrates as energy and burn fat when needed. As we age, however, our muscle and tissues can become resistant to the glucose transport signals of insulin, which is called insulin resistance (the opposite of insulin sensitivity). The cells and tissue respond more slowly, resulting in higher glucose levels circulating in the blood for longer, which triggers the release of more insulin. It is like the receptors on the cell walls of the muscle tissues get corroded and cannot work as efficiently as they used to. Eventually, the muscles respond to the increased insulin, transporting glucose into the cells, and maintaining control over blood glucose. The increased insulin also triggers sharp dives in blood glucose, making you feel lethargic and sluggish. You may not see it or feel it, but your insulin levels have changed your metabolism and it is easier to gain weight and increasingly harder to lose weight. Higher levels of insulin also promotes fat storage and prevents fat from being burned as energy. This is the dirty little secret of metabolism as you age – insulin resistance make it more difficult to lose weight and may make you feel the ups and downs of energy swings from blood sugar more acutely. Thus, insulin sensitivity is directly tied to blood sugar management, weight control and energy. Eventually, in some people, the pancreas fails to keep up with the increased demand for insulin and blood glucose levels start to rise. Insulin levels remain high and may get higher as the pancreas is still struggling to maintain control. When fasting blood glucose levels rise higher than 100 mg/dl but are lower than 126 mg/dl, that person is considered to be “prediabetic”, according to the American Diabetes Association. When fasting blood glucose levels are higher than 126 mg/dl, that individual is classified as a type II diabetic. 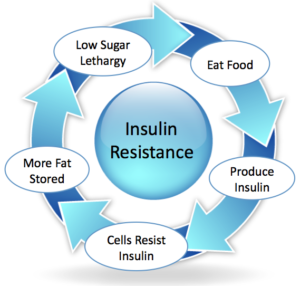 This process (increasing insulin resistance and eventual loss of glucose control) may take 10-15 years. Even if your doctor is seeing you every year, he or she may measure glucose, but never insulin. And because glucose is the last biomarker to change– long after insulin levels rise. It is not hard to see why only 1 out of 10 people with prediabetes know that they have it. How could they? Insulin resistance and high insulin levels do not make you feel any differently. It is very comparable to high cholesterol (a major risk factor for heart disease). You suspect that your metabolism has changed, and you’re right, but you probably have a hard time understanding the specific details. Insulin sensitivity is a key biomarker for metabolism. Right now, it is a really important secret weapon in managing your weight, your energy levels and your health.